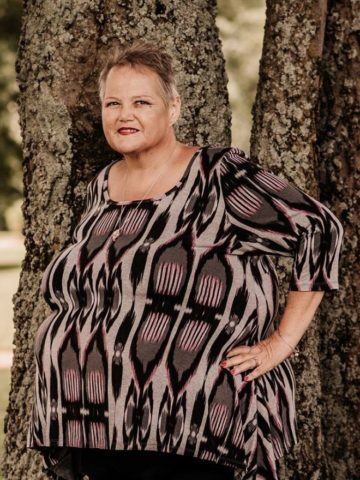 Esther Anderson Wayman, age 55 of Hendersonville, passed away on August 27, 2018 at Skyline Madison Campus. She was born on September 12, 1962 to the late J Mart and Lottie Anderson in Nashville. She married the love of her life on March 12, 1983 and would be blessed with two children and a precious granddaughter. Esther was described as being a loving person with a servant’s heart. She worked hard for her family and friends. She loved to crochet and made sure every newborn baby close to her had a new blanket made with love. Along with learning new crochet patterns, Esther took piano lessons, she enjoyed learning new things. She was diagnosed five years ago with stage four cancer. Where some people would give up she pushed through, she never let the fact that she was sick get in her way. She continued to work every day without missing a day, made sure every birthday was perfect for each family member and made sure that her son and daughter-in-law’s popcorn bar at their wedding was perfect. With Marley Girl, who was a certified therapy dog, by her side Esther continued to make rounds at the Children’s Hospital even after her diagnosis and had a compromised immune system; Its warmed her heart to see the children smile. She continued to ride motorcycles with her husband in North Carolina at the Dragon, which was their favorite place to ride. She was a warrior and determined to live life to the very fullest. In addition to her parents, Esther is preceded in death by her sisters, Melinda Long and Deana Anderson. She is survived by her husband Mike Wayman of 35 years; children, Elliott (Amy) Wayman and Anna Wayman; granddaughter, Alexandra Musgrove; dog, Marley Girl; and siblings, Samuel (Lula) Anderson, David Anderson and Marlette Wildmone. A Life Celebration will be held at Madison Christian Church at 1pm on Saturday, September 8, 2018 with Pastor Caryl Strange officiating. The family will receive friends on Saturday from 10:00am until the time of service. After the service there will be a motorcycle ride to Springfield Memorial Gardens for burial. In lieu of flowers the family request memorial donation be made to the Ovarian Cancer Society, 3800 Maple Avenue, Suite 435 Dallas, Texas 75219 or Gilda’s Club Middle TN 1701 Division Street Nashville, TN 37203. These arrangements were entrusted to Springfield Memorial Gardens, Funeral Home and Cremation Center 4005 Memorial Blvd Springfield, Tennessee 37172 www.springfieldfh.com 615-384-5437.